From soil to store: The making of Farm Away! While the rest of the mobile gaming world is still trying to figure out the best way to monetise their games, it looks like Finnish start-up Futureplay might well have worked out it. 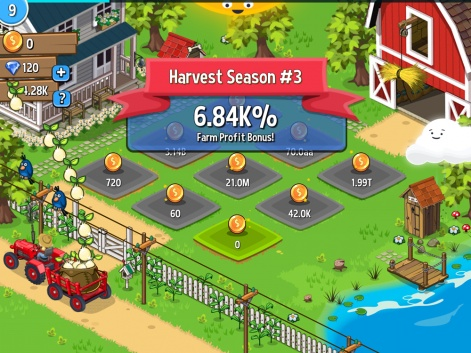 Their debut title, Farm Away!, garnered an impressive ARPDAU of $0.082 from around 100,000 daily users in its first week alone. And it did so with a heavy focus on incentivised ads, using a model the company calls "View-To-Play", which focuses on attributing the ads to positive impacts, rather than as a result of failure. With a major content update released recently, that more than doubled the size of the game, we decided it was time to ask Futureplay's CEO, Jami Laes, all about how the game came about, the new update, and the future of the company. Note: Laes will also be speaking on the subject at Pocket Gamer Connects London 2016. PocketGamer.biz: When did you realise that designing a game around rewarded video ads was something you want to try? Jami Laes: We wanted to focus on View-To-Play and ads done right already when starting up the company. Why did you decide farming was the best concept? We thought farming is mass-market theme that fits well with idle gaming, and that the competition was ripe for disruption with a faster, funnier and innovative take on farming theme. Given the game launched with limited gameplay, were you worried that there wouldn't be enough for players to do? We took a calculated risk of not putting everything into the initial launch that we wanted. We wanted to keep moving fast, launch early, and not wait. We were already far along in development with the first update when we launched globally, so we knew we could quickly release a lot of interesting content and gameplay after launch. How long did the game take to develop and how many people were involved? It took us about 5 months from start to submission, with a team of four people working on the game hands-on. It took us about 5 months from start to submission, with a team of four. Where there any key challenges you had to overcome during development? There are always some hiccups during development, but it was a very smooth project that went pretty much exactly we wanted and planned it to. When did you first think the game/concept was going to be popular? During the summer in our player tests and playing the game ourselves, we started to feel the familiar feeling that you are onto something when the game just honestly feels fun to play. How much testing did you do before launch? We did some rounds of player testing to focus on the user experience, and of course functional and localization QA rounds with external testers and internal testing. We improved the tutorial and caught a few bugs. During soft launch we balanced the economy based on results from our multi-variate tests. Fundamental to the View-to-Play concept is having enough video inventory to fill the slots, how have you found the rewarded video ecosystem in this regard? We haven't had any issues with inventory, and we have been very happy with the performance and scale of our partner ad networks. Initially you were seeing ARPDAU of around $0.08. Have you maintained this and do you think this level will scale? We have maintained a really healthy ARPU across all regions and globally as well. The global level depends a bit on where are active players are coming from on a daily basis. The latest update ups the number of plot types from 9 to 22, was it your intention to increase the game so dramatically in size when first designing it or has this come about from player feedback? We already had the update almost fully baked when we launched globally, so we always knew we were going to need more animals and crops for the players. We also heard feedback from our players after launch, and it was great to know we were soon after launch able to cater to their wants and needs. With the winter update you've added shoeboxes, which are best acquired using gems, the game's hard currency. Is this a deliberate shift from the view-to-play model? Shoeboxes and the puzzle pieces that they contain are available from viewing ads, collecting crops and harvesting, so they are not only available with gems. We felt from the start that the collection, unlocking, and being able to get new animals and crops to your farm would be key and that it needed to be well balanced between all player styles. What future update plans do you have? We will of course be adding more animals and crops to the game over the months to come. It's not the model, it's the implementation that matters and how it all plays out as a whole. We are also looking into features that add more to social, co-operation, and competition in a new and innovative way. The View-to-Play model seems like a perfect fit for idle games, but are there other genres you could see it being used? I don't see any reason why View-To-Play couldn't be leveraged in any type of game. When Free-to-Play was new for developers, there were a lot of genres that seemed impossible to get to work with F2P - but since then they have all been done successfully. Do you think other developers will adopt the model, or is it going to be a Futureplay signature payment model? I hope others will take better use of ad focused models like our View-to-Play, and keep on innovating and improving the play experiences for mobile gamers. We like the feedback and results we have seen with our first title and will continue to improve on that going forward. Can you reveal anything about your future games? They will be awesome, they will come sooner than you think, and you will be happily surprised how we will be innovating some mass-market themes. Stay tuned.